-The team that starts the game is the team that is in circuit (A). Player places the ball on the starting line. Referee will give verbal warning – ready- and the table referee will turn on the red light warning of the imminent start of the game. Referee will press the green light button which will mean the start of the timer which will show the time of execution of the 2 circuit by the teams – time frame will be determined by the organization in accordance with technical estimation. 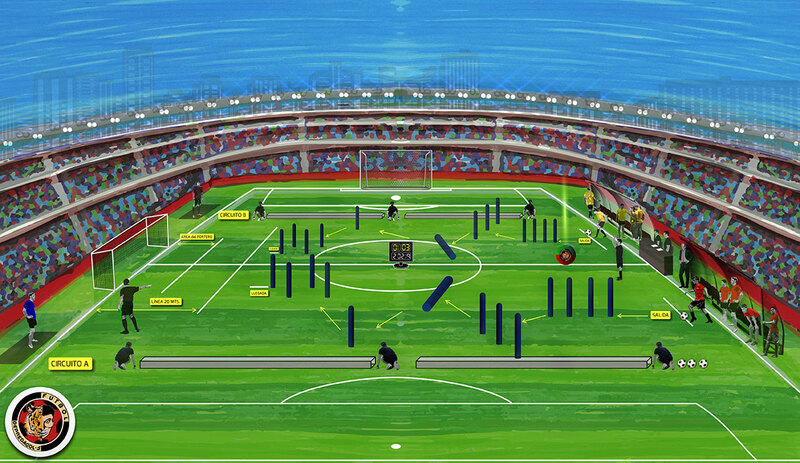 Players must save the circuit obstacles (A-B) without fail and ending with a kick to the goal without passing the 20 meter line. – In the circuit (A) player will kick with his right leg and in circuit 8B) with is left. – In the case that the playing order is altered by any player, the team series will be canceled. – In any case arms and hands will be allowed. If this happens, the player series will be cancelled. – Players must finish the drill in the time established – technical estimation of the organization – in the case that a team exceeds in time, teams series will be cancelled. 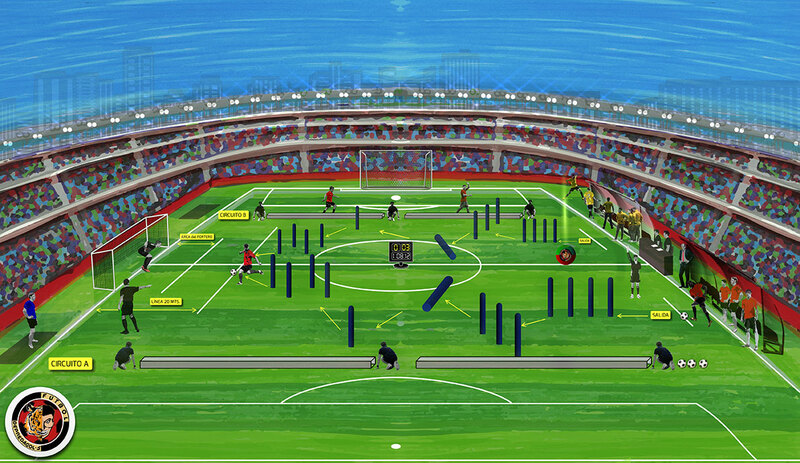 – Goalkeepers will be at the side of the goal – one on each side and in a waiting zone marked waiting their turn. – The main referee will stand at the beginning of the game to ensure that players start correctly, and the decisions that affect de game development. 1st assistant, follow the drill course to note any discrepancy, noting the player, the action and when the drill ends notify the referee. 2nd assistant, close to the bottom line – beside the goal – perpendicular to the finish line to determine the legitimism of the goals. In charge of working the electronic devices – starting lights, note the goals, times completed by teams and players. – After the 1st pairing series there will only be 4 players left and in the hypothetical case that all players from the same team win, obviously the face to face will finish. In the next pairings, the best individual times of each team will choose the rivals and so on until no players are left of on one of the 2 teams. – Players will try to save obstacles without fail trying to reach the final drill of the circuit where they cross each other driving the ball around the exterior of the circuits to start over swapping circuits; the 1st to reach the finish line will determine the winner. – The players that do not will the face off will be eliminated of this II period. Play offs will continue until all players of one team are eliminated. – Player with an invalid start will get one warning and will be disqualified on a 2nd invalid start. In this case, his rival will have a free kick from the 20 meter line. – Goal keeper cannot exit the small area to defend his goal. – Goal keepers will stand at the sides of the goal – one on each side and at a designed place waiting to occupy his goal when it is his turn. – He will be in charge of the game at all times and will take all decisions of what occurs during the game. – Player will start with the 1st interior ball, regardless its right or left – with his “good” leg – continuing with the exterior balls finishing with the center one situated perpendicular to the goal. – If the red light turns on, it means that player has exceeded the time allowed and series will be cancelled. – If the player jumps the free kick order, the series is cancelled. – Will take control of the kicks and will make all necessary decisions in the free kick area. – The other assistant will note goals of each team.